The Internet has become an essential tool for collecting and delivering information in our daily life and work. With the global advance of infrastructure for broadband services, moving image is being distributed as more a efficient media for delivering information compared to texts or still images. However, languages serve as impediments to global distribution of video content. So, what do you do when you want to communicate with the whole world? We will provide full support for global distribution of your existing footages by processes such as subtitling into multiple languages. We create a streaming file after digitizing your existing footage and inserting subtitles. * Please choose the type of streaming file from Windows Media, Real Media, Quick Time and Flash Video (2,160 JPY will be charged for each additional format). * For highly professional content (such as medical-related content), rates may vary. Please inform us of details of content when you order. * Please contact us for other languages. We create playable DVDs after digitizing your existing footage and inserting subtitles. * Please contact us for footage exceeding 5 minutes. The data will consist of 10 or less chapters and one title. * The above-mentioned rates are for creating Master DVD. Sub Packages are provided after digitizing your existing footage and inserting subtitles (finished data: AVI). * Additional 1,080 JPY will be charged for delivery in the form of tapes. We thank Directors, Makoto Yamaguchi and Gerald Gutschmidt who provided the sample videos. The entire works are now showing at CON-CAN Movie Festival for free. 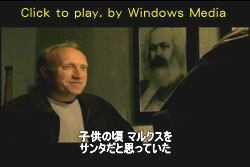 * To watch the samples, Windows Media Player is required (Click the images above).